In WordFly's Pages editor you can adjust the settings of your Page by clicking on the cog icon from the edit content panel (left side) of the editor. The settings area gives access to updating your field markers and then there are two ways to adjust your field marker styles. We'll review everything in this support article. When you are building a Page, there are fields which you can choose to make required in order to finish an RSVP or Survey. If the Page is submitted without the required field, an error message will prompt. You can change the required field marker in your Page settings. 1. Select the cog icon from the edit content panel (left side) to access the settings for your Page. 2. Update the text in the Required field marker field. 3. Save your email design. Your required field markers styles can be adjusted globally or individually. 3. Open the Required Marker element. 1. 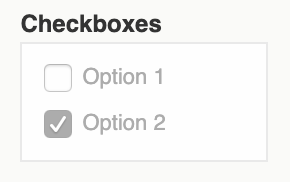 Click on a form block from your preview panel (right side). 4. Modify the styles for This block only. 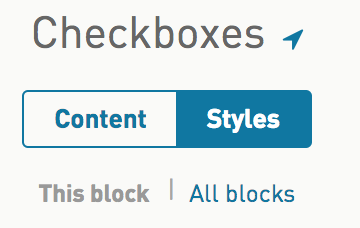 Or, toggle to All Blocks to modify the required marker styles for all form blocks like this. This step is the same as updating in the STYLESHEET directly.